In Chess for Life, students learn about decision-making and relationships as part of a game-based sentencing program. 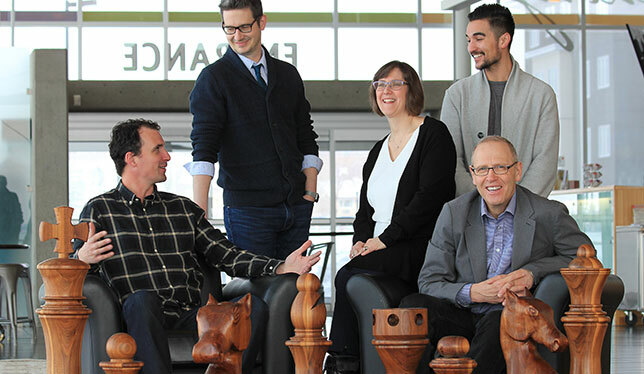 Most Friday afternoons, Lance Grigg and a few researchers with chessboards take over a classroom at the University of Lethbridge. They set up the chessboards, put out some snacks and get ready to welcome a small group of young offenders who are learning to play the game as part of their sentence. Developed in partnership by the university and Alberta’s Ministry of Justice, Chess for Life is an alternative sentencing program for 12- to 18-year-olds. At these sessions, students play chess against volunteer instructors and with each other. Parole officers and parents will often attend to support a student, said Josh Markle, a Chess for Life volunteer chess coach and an instructor in U of Lethbridge’s faculty of education. Dr. Grigg, an associate professor in the same faculty, came up with the idea in 2016, when he heard that a local judge, Derek Redman, had sentenced a 12-year-old first-time offender to probation and five hours of basketball practice a week. Dr. Grigg liked the idea of moving away from punitive models of justice, and it got him thinking about chess. The Chess for Life research team. Left to right: Josh Markle, Jeffrey MacCormack, Monique Sedgwick, Riley Kostek and Lance Grigg. Photo courtesy of the University of Lethbridge. Dr. Grigg brought the idea of an alternative sentencing program and research project to Judge Redman, and by January 2018, they had approval from both Alberta Justice and U of Lethbridge’s ethics council to begin. With a research team comprising Monique Sedgwick, an associate professor of health sciences, Jeffrey MacCormack, an assistant professor of education, and volunteer instructors Riley Kostek and Mr. Markle, Dr. Grigg led a first round of participant interviews in spring 2018. It’s too soon to share specific research findings, but Dr. Grigg said the results have been observably positive. Up to 15 youth have come through the program so far. Some have continued to attend Chess for Life after they’ve served their sentences and have even gone on to compete in tournaments like the Lethbridge Open. Ultimately, Mr. Markle said, the program emphasizes relationship-building. Chess for Life largely runs on donations and support from U of Lethbridge’s faculty of education, with organizers paying for some expenses out-of-pocket. It hasn’t stopped Dr. Grigg from looking to grow the program to Calgary and Edmonton, however. And as a proactive measure, the researchers visit elementary schools across Canada to discuss Chess for Life, and encourage teachers to incorporate the game into their classrooms.